Last Fall, I had the opportunity to spend some time with designer Amanda Nisbet and discuss her then soon-to-be-released line of lighting for The Urban Electric Co. For those of you who know Amanda or who are familiar with her work, you know that she is a designer who has never shied away from using color. Perhaps it's a result of her colorful personality, one that is bubbly, exuberant, and just plain fun. This sense of playfulness comes through in her design work, and I'm sure it was a big influence in her now newly released lighting line. What makes this line unique is, surprise, surprise... Amanda's use of color. All of UECo. 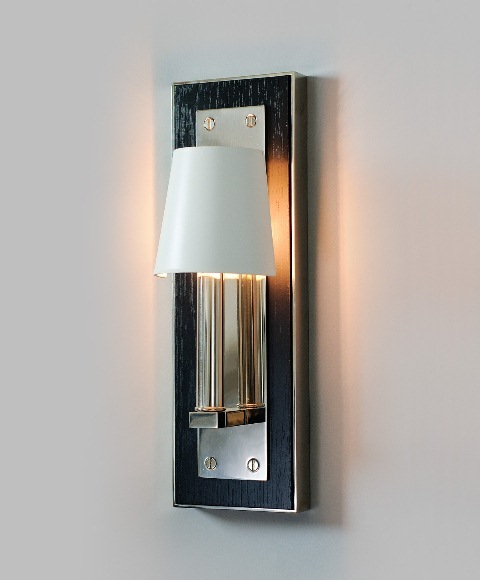 's lights are available in a variety of standard and premium finishes and glass options. And in the case of Amanda's new line, some of the lights also come in a choice of different vivid colors like Forest Moss and Million Dollar Red. (Color matching is also possible.) 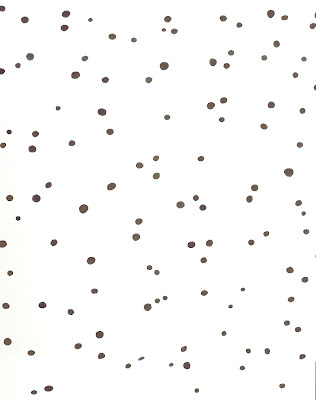 It's such a great way to perk up one's walls and ceilings. 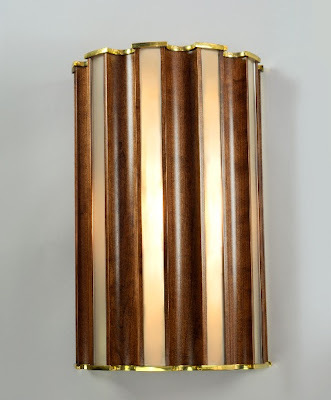 I admit that when choosing fixtures for my house, I stuck to the basics: chrome and antiqued brass. But now with this new line, I finally see, um, the light of day. Leave it to Amanda to show us that lighting can also be a lot of fun, too. Swank in polished nickel with navy shagreen and Deep Royal paint. 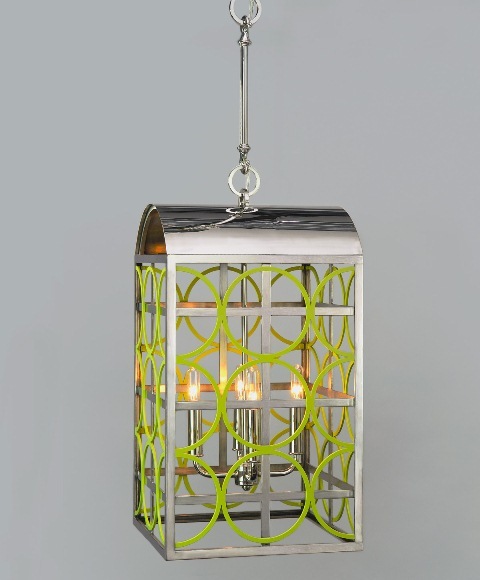 Sabina in polished nickel and Forest Moss paint. Ben in ebony with polished nickel. 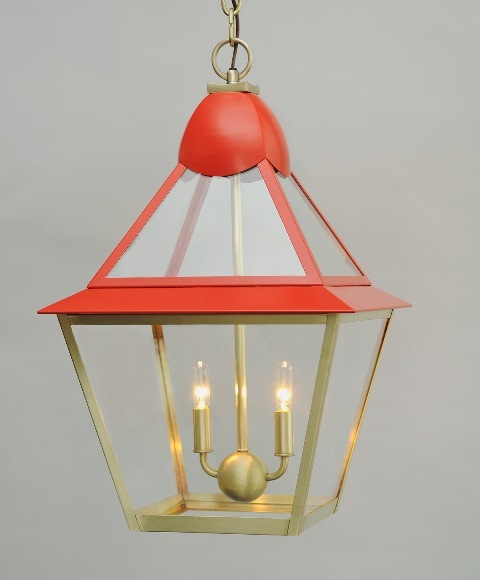 Travers in cherry and polished brass accents. 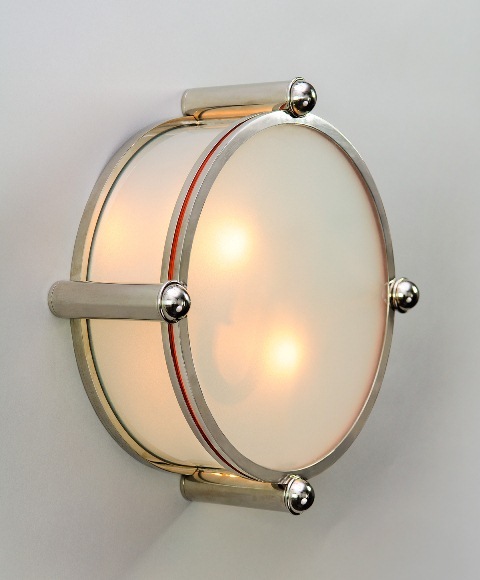 NYC wall fixture in polished nickel with Million Dollar Red accent stripe. This lamp is also available as a ceiling fixture. Image at top: Poppy in hewn brass and Million Dollar Red paint. All images courtesy of The Urban Electric Co.
One of the beauties of being an adult is that you don't have to wait for Santa nor the Easter Bunny to bring you what you want. You can simply go out and buy it yourself. In my case, that would be Cadbury Creme Eggs, something which I know a lot of you find to be downright dreadful looking and tasting. I really and truly find them delicious. Now what I can't stand, though, are Peeps. Just the thought of them makes me queasy. Oh well, each to his own. I think that one chocolate we might all be able to agree upon are Easter candy and pastries by Ladurée. I can't vouch for the taste, but the confections look beautiful, perhaps even too beautiful to eat. 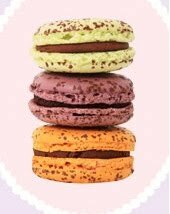 Their Easter macaroons include Chocolate & Lime, Chocolate & Cherry, and Chocolate & Passion Fruit. Moulded Chocolate Eggs are filled with sweets and pralines. From left to right: The Bright Nest- strawberries, rhubarb, ladyfingers, and Marra Wild Strawberry cream; Colored Eggs; The Silk Nest- Coconut dacquoise biscuit and tropical fruits. Teddy Bear Chocolates were created to celebrate Chocolate Day. All images courtesy of Ladurée. You'll have to forgive me. I'm on a tear about The Finest Houses Of Paris . There is just so much in that book to look at and, well, talk about. Seeing that yesterday's post was about Walter Lees, it seemed fitting to include photos from the book's chapter about Hôtel d'Orrouer, the Paris home of Lees' great friend Hubert de Givenchy. As I mentioned yesterday, Givenchy lauded his late friend's "perfect taste", two words that I think also describe the Givenchy aesthetic. 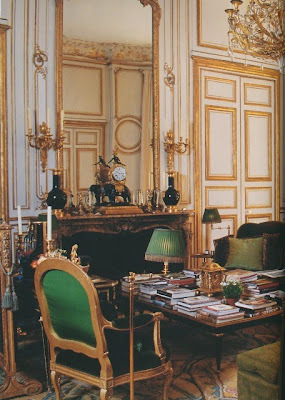 In fact, many interior designers credit Givenchy's homes as inspiration in their own work. I understand why. 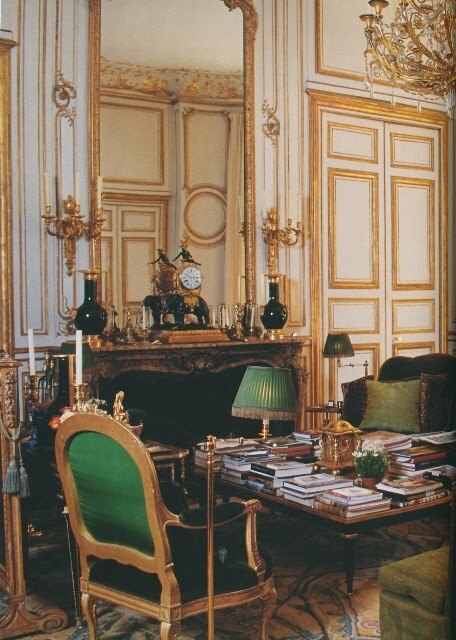 The couturier is able to achieve just the right balance of luxury and simplicity in his homes, and he does so effortlessly. Or at least, it seems that way. I'm sure that most of you have already seen numerous photos of the interiors, so I'm not showing you anything new. What I liked about the photos featured here, though, is that they are vignette shots which give us the opportunity to study the Givenchy style in detail. Who better to learn from than a master himself? A closer look at the sofa and lampshades that have inspired more than a few designers. A simple table set for lunch. Simple, but certainly not ordinary. 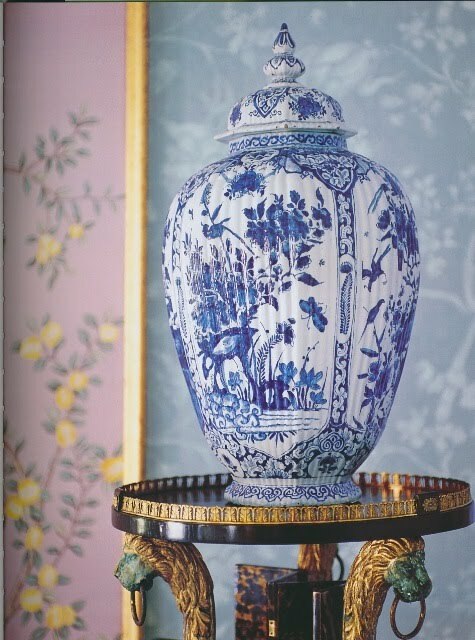 A white linen cloth and chair slipcovers serve as a backdrop for blue and white Compagnie des Indes plates, embroidered monogrammed napkins, and a beautiful 18th c. silver tureen. 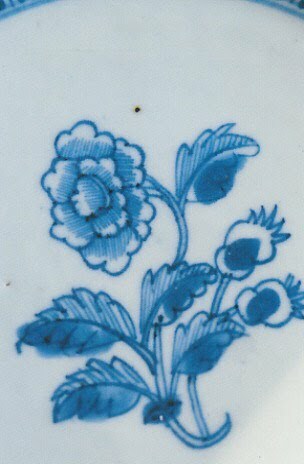 A detail shot in the living room. 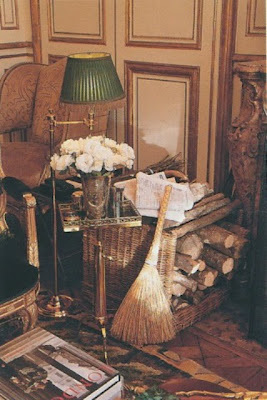 A basket of wood and a broom placed next to the fireplace add a rustic touch to a luxurious room. 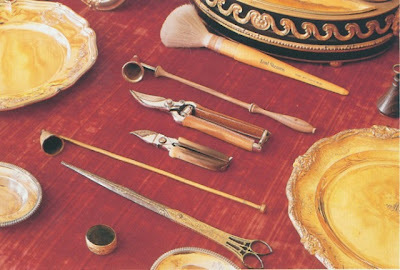 Givenchy's dressing table with various implements laid out on red velvet. 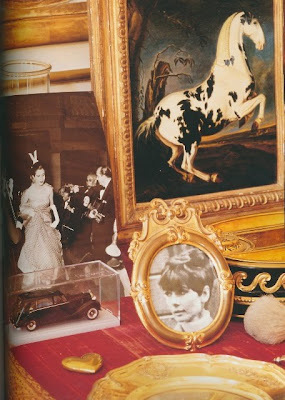 Audrey Hepburn, Baroness Gabrielle van Zuylen, and a piebald horse also grace his dressing table. All images from The Finest Houses Of Paris by Christiane de Nicolay-Mazery, Jean-Bernard Naudin photographer. Last Friday, I had to break down and turn on the air-conditioning. That's kind of obscene considering that it's only mid-March, but living on the eighth floor of a high-rise when it's 80 degrees outside (and surrounded by floor to ceiling windows mind you) equates to one HOT apartment. In addition to keeping me cool, the air conditioning made me excited about Spring and Summer and thoughts of white jeans, cold suppers, potted geraniums, and crisp Rosé. Oh, and floral table linens too. When I was growing up, we used to dine out on our back patio during the Summer. What I remember vividly were the floral cloths and napkins with which my mother set the table. 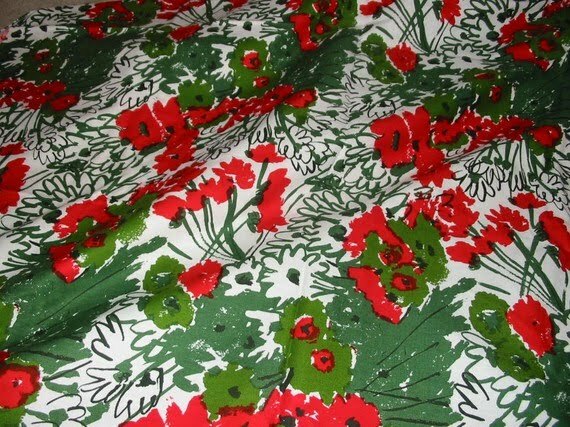 There was a Vera floral print quilted cloth similar to that above. (That's a Billy Baldwin room at top, by the way.) 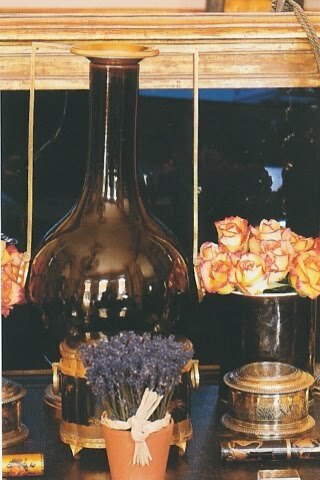 I also remember a violet print tablecloth and a floral Porthault cloth and matching napkins. I'm assuming that my mother also used solid cloths and napkins from time to time, but truth be told, I have no memory of them whatsoever. 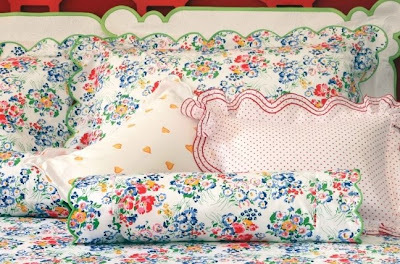 It's those cheery, colorful floral prints that have stuck with me through the years. Looking through my linen closet, I realized that I have a lot of solid hemstitched linen. Yes, it's beautiful, timeless, and always appropriate. But you know what? 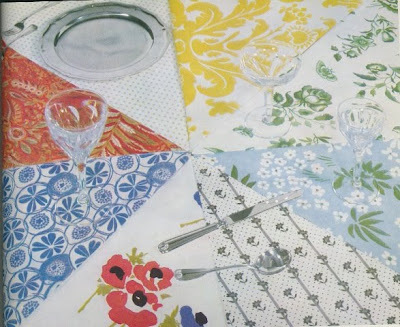 It doesn't put a smile on my face the way that those exuberant Porthault tablecloths or vintage Vera napkins do. 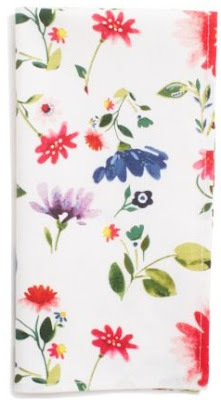 Seeing that Spring has sprung, I think that I need to remedy this situation by buying a floral cloth or two. I think, though, that Billy Baldwin's words sum up the allure of these floral prints best: "In the end, decorating is all about color. 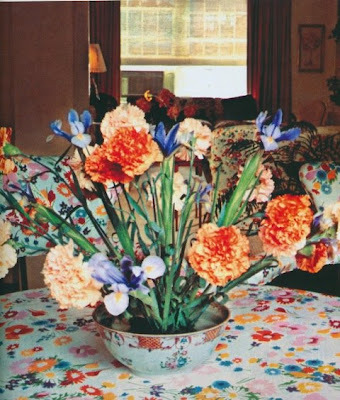 Think about colored flowers on bright white cotton and, in the same room, right next to this celebration of color, is more color- fresh flowers, lots of them. To each of you I send a huge bouquet of brightly colored cotton flowers." 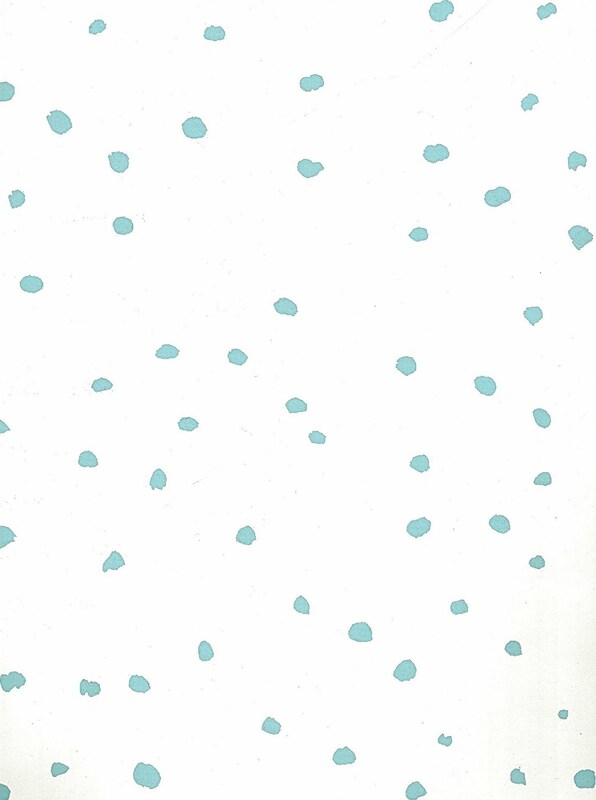 How nice would it be to have Porthault's classic New York Mille Fleurs print fabric made into a cloth and napkins? Alternatively, I could just buy a sheet in the print and use it as a cloth. I'm thinking of ordering these Botanical napkins from Sur la Table. They come with matching laminated placemats, and while I would prefer cloth ones, I'm not opposed to laminate. If you use them for everyday dining, they're certainly easy to clean. 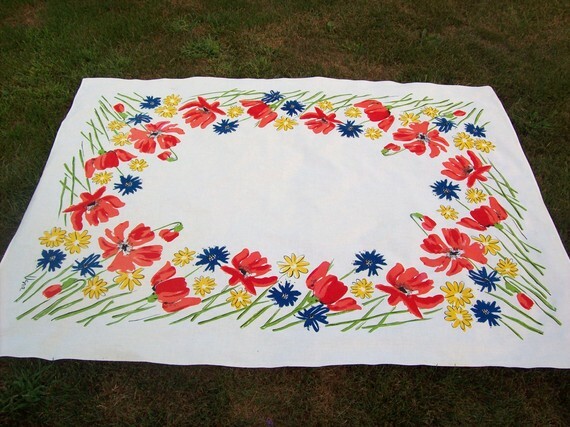 Now this vintage Vera tablecloth and napkins on Etsy really make me smile. They remind me of my favorite geraniums. If I had a larger table, I would snap this set up in a heartbeat. An equally charming vintage Vera tablecloth on Etsy, though this one is bit more subdued than the previous one. In the vintage Tiffany Table Settings book, floral table linen seemed to be a favorite amongst the featured designers and socialites. As the book mentioned, "The magic of background color and pattern provides a whole new dimension in table setting design...The colored and patterned cloth makes an interesting background for the display of objects. It can establish an entire mood for the setting." Image at top plus Billy Baldwin quote from Billy Baldwin: The Great American Decorator by Adam Lewis; last photo from Tiffany Table Settings . 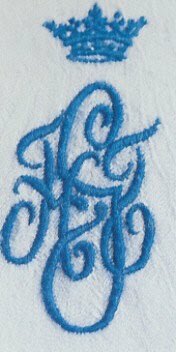 If you've been out and about in the blogosphere, you've more than likely heard about Katherine Rally Textiles. The Bali-based textile company was started a few years ago by Katherine and Rally Dupps, a young American couple who sought adventure and settled down in Southeast Asia. The couple became fascinated by Indonesia's batik cloth, an indigenous method of textile printing that involves wax resistant dyeing. Katherine, an interior designer originally from Arizona, and Rally, an architect who hails from Nashville, decided to create their own line of batiks, albeit ones with a more Western aesthetic. I recently met with Rally during his visit to Atlanta and got to see his fabrics in person. 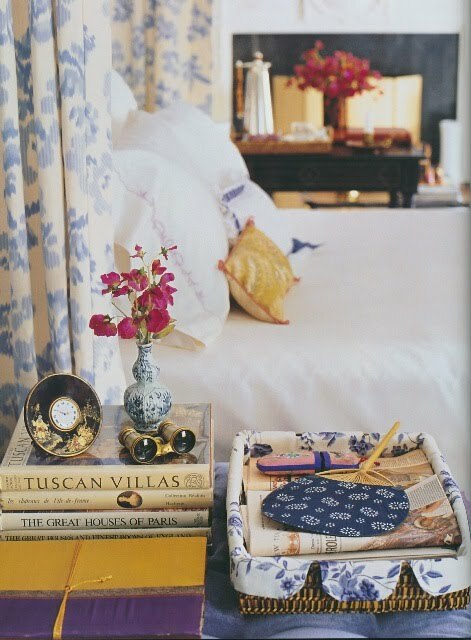 The linen prints are cheery without being giddy, meaning that they're tailored enough to work in a variety of rooms. And the colors are really rich as well. 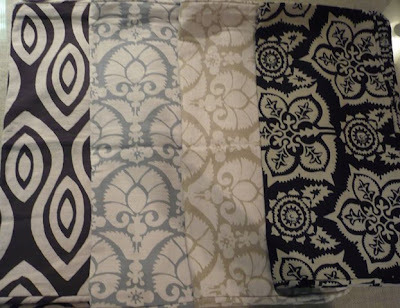 Quite a few of the prints even come in gray, a colorway that is not as easy to find as one might think. I'm trying to find a place to use either Roman or Turkish Eye in gray. Anyway, I encourage you to take a look for yourself. It's a really interesting line of fabrics produced by a very interesting (and gutsy!) couple. 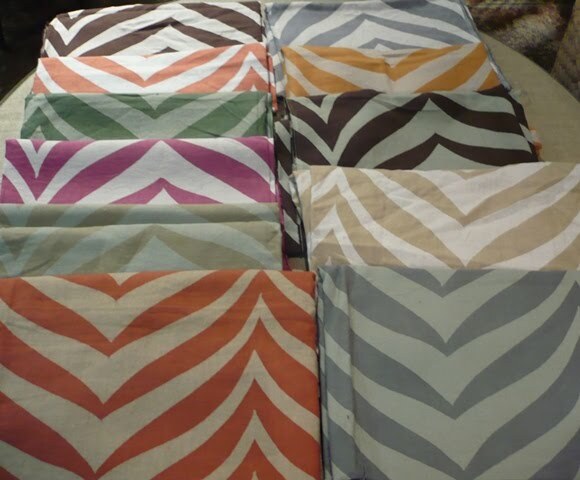 Travis & Company in Atlanta carries the Katherine Rally Textiles line. For more information, contact Dolly Crafton at (404) 237-5079 or dolly@travisandcompany.com. 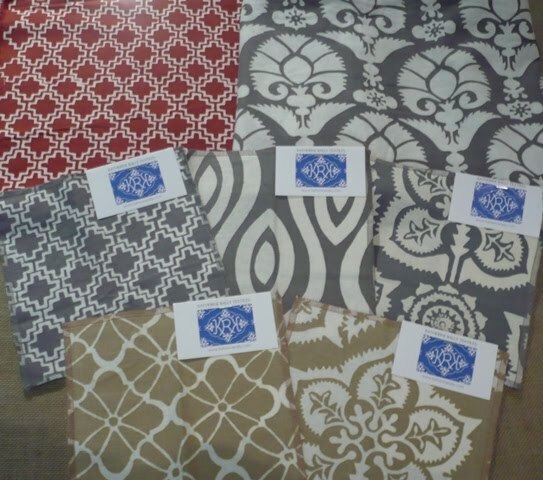 Back row, left to right: Roman in Terra Cotta; Pondicherry in Castle Grey. Second row: Roman in Castle Grey; Turkish Eye in Castle Grey; Mrs. Jones in Castle Grey. 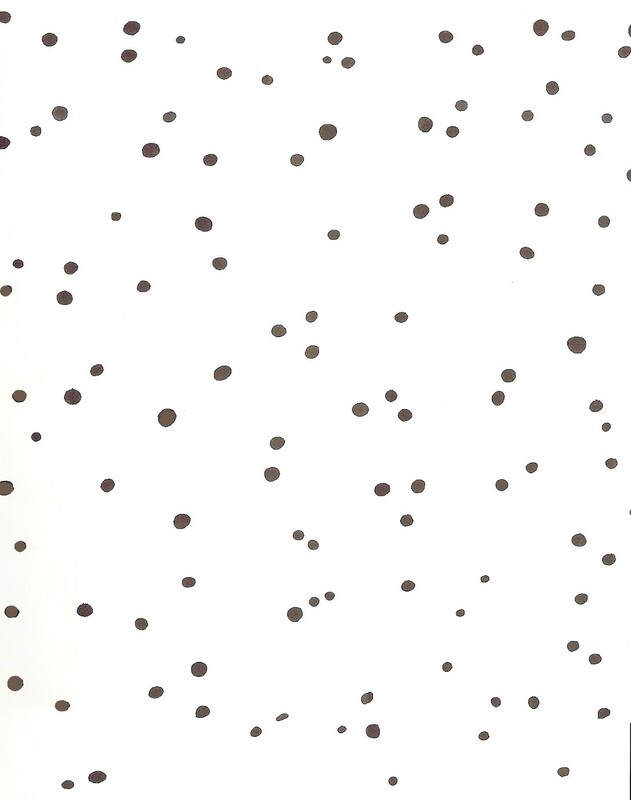 Bottom row: Monaco in Sahara Sand; Mrs. Jones in Sahara Sand. 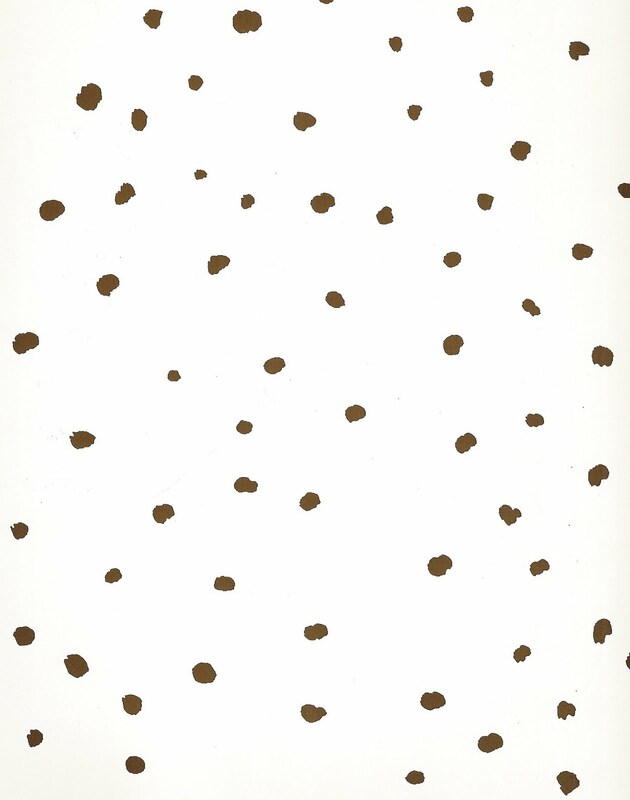 Katherine Rally's interpretation of an animal print is called Madagascar, and it is printed on 100% lightweight linen. 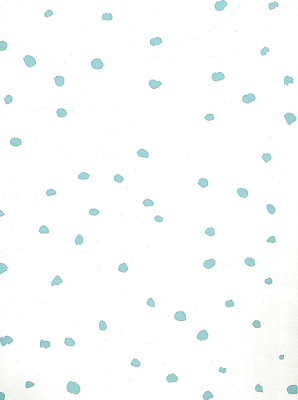 The various colorways, including Castle Grey, Bougainvillea, and Kelly Green, are printed on different colored linen backgrounds like cream, white, and mint. There is a color here for everybody. Left to right: Turkish Eye in Chocolate Brown on Khaki linen; Pondicherry in Castle Grey on Khaki linen; Pondicherry in Sahara Sand on Khaki linen; Mrs. Jones in Midnight Blue on Khaki linen. All photos by Jennifer Boles, The Peak of Chic. A few weeks ago while reading through the Winter 1996 issue of Veranda, I found an article on Harry Hinson and Hinson & Company. 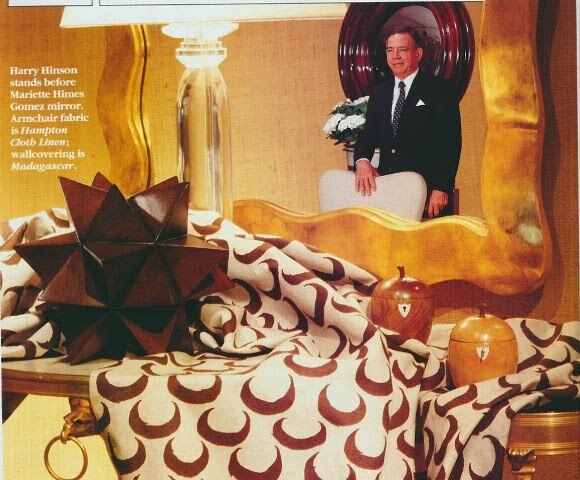 That got me excited because Hinson fabrics and wallpapers have always been amongst my favorites. 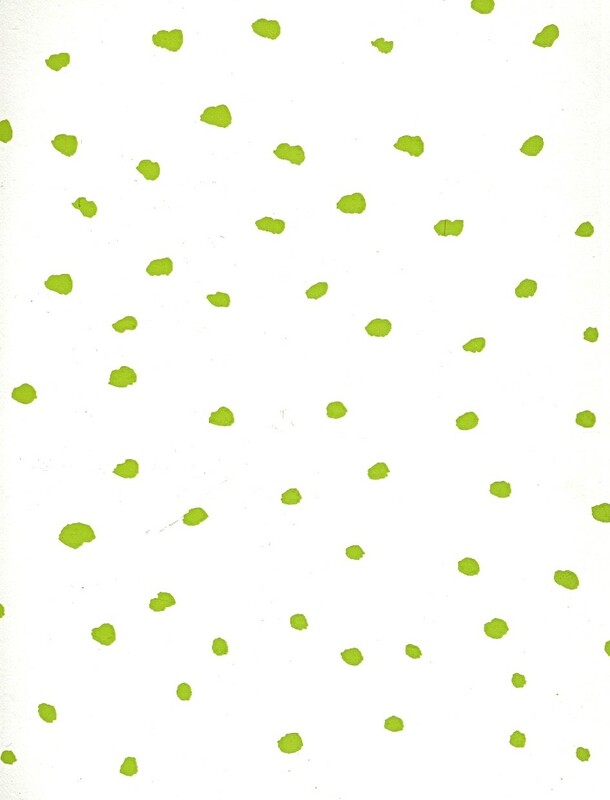 But then, I read the part where Harry mentioned that Van Day Truex once remarked that Kitty, a print introduced in 1972, was "the most stylish wallpaper I have ever seen." Needless to say, I absolutely had to see what Kitty looked like. If VDT said it was the most stylish he had ever seen, then I knew that it just had to be. Harry was kind enough to send me scans of Kitty samples. 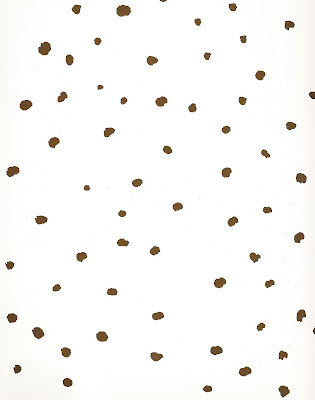 As you can seen, it was a loose polka dot print that came in blue, brown, and green colorways. I use the past tense as unfortunately, the print has been discontinued. However, there is a similar print that is still available as part of the Albert Hadley collection for Hinson. Guess what it's called? Van. How appropriate. PS- I can't write a post about Van Day Truex without mentioning Adam Lewis' terrific book Van Day Truex: The Man Who Defined Twentieth-Century Taste and Style . In my opinion, Truex' work is "the most stylish that I have ever seen." Image at top: Harry Hinson in Veranda, Winter 1996, Peter Vitale photographer; all other images courtesy of Hinson & Company. 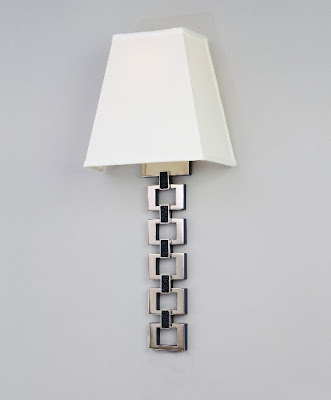 I've always been a fan of Atlanta designer John Oetgen. Somehow, he seems to know exactly how to strike the right balance when mixing the old and the new. It's really a skill to be able to make it all seem so natural and so not forced, and John has obviously perfected this skill. 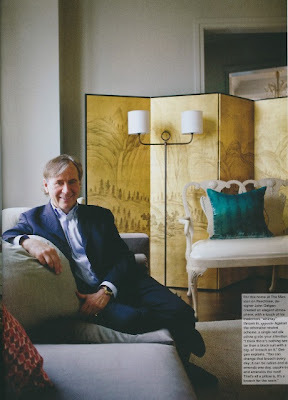 Late last year, John was asked to decorate the model apartment at The Mansion on Peachtree, a luxury high-rise in Buckhead. The unit was part of the Atlanta Homes & Lifestyles Christmas House tour and was recently featured in the March issue of the magazine. I can't tell you how many times I've stepped into a model home or apartment and was struck by the sterility and lifelessness of them. But John's unit was totally different. You got the sense that a real person- one who was sophisticated and worldly- actually lived there. Perhaps it was because John seemed to pay so much attention to the details. One detail in particular that I liked was the sunburst ceiling fixture in the entryway. 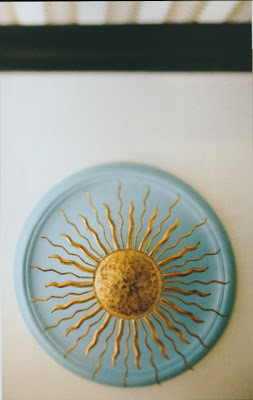 John placed it over a ceiling medallion that he painted blue. Clever, no? I'm including a few images from the Atlanta Homes & Lifestyles' article (March 2011 issue), but for the full text and images, visit the magazine's website. The chic little foyer. 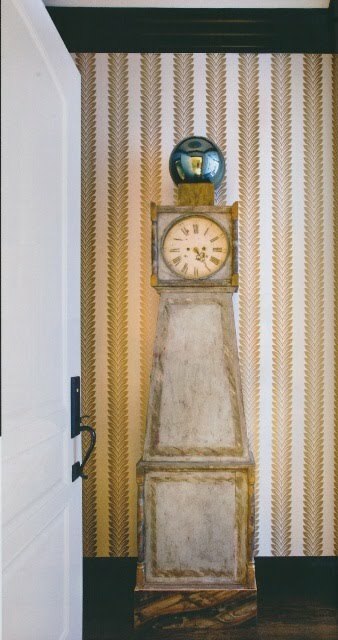 I love that wallpaper combined with the black trim. 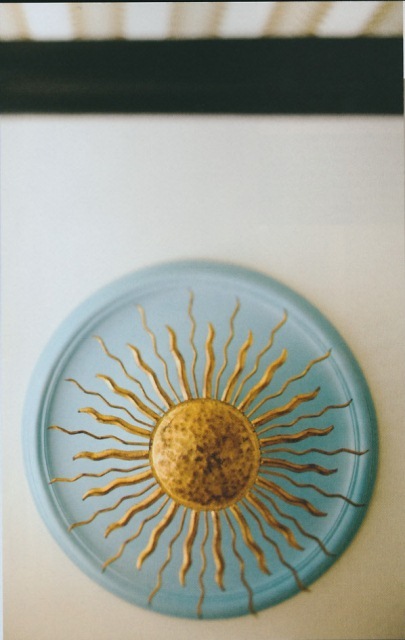 The ceiling of the foyer featured this blue medallion and sunburst light fixture. The breakfast table was surrounded by these fabulous chairs. The nail head trim and handles really make those chairs. And, now for some shameless self-promotion. 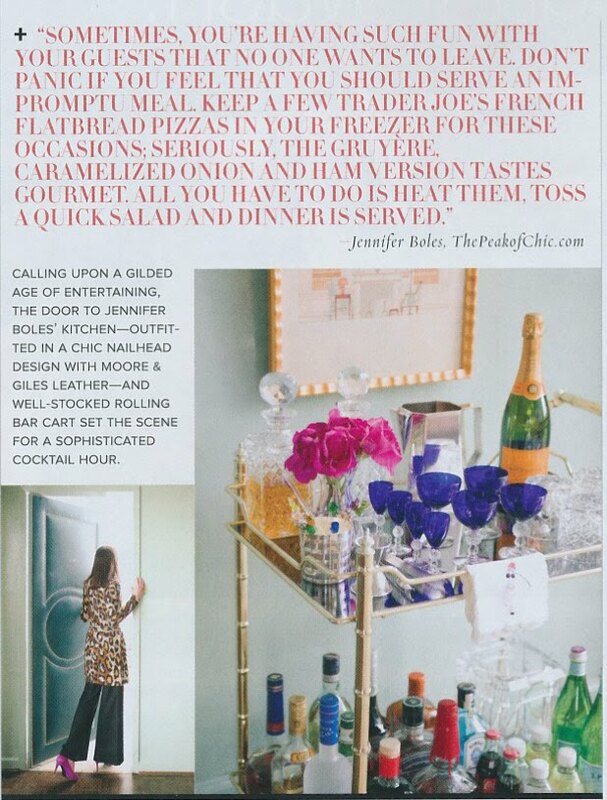 My bar cart, my kitchen door, and my back were also featured in this issue in a special section on entertaining titled "On the Rocks". 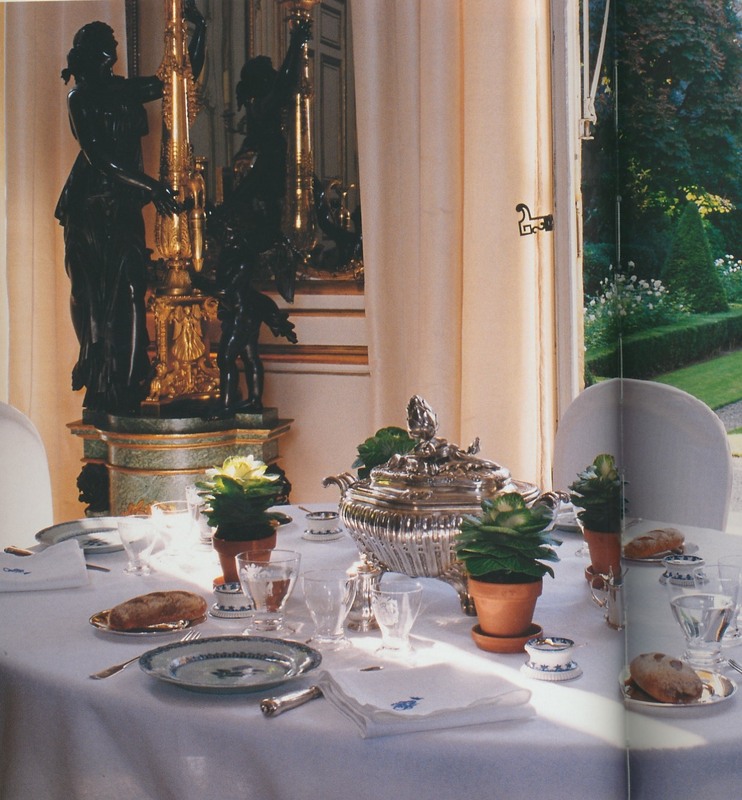 Read my quote about what to do with guests who stay forever and how to feed them. Of course, now all of my friends are asking me if they were the guilty parties. 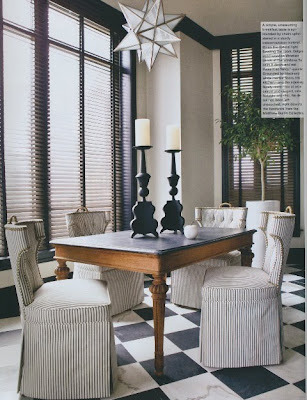 All images courtesy of Atlanta Homes & Lifestyles, March 2011. Oetgen photos by Erica George Dines; bar cart and door photos by David Christensen. Images printed with permission from Atlanta Homes & Lifestyles. 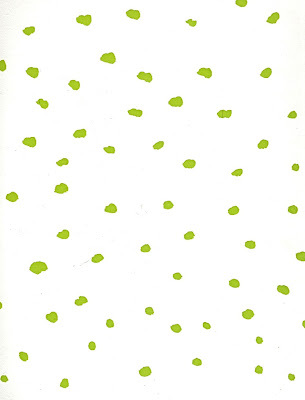 Years ago, I read Charlotte Moss' Design Inspirations, Vol. 1 , a terrific book which detailed four show house rooms created by the illustrious designer. The only problem was that after reading it, I wanted more. 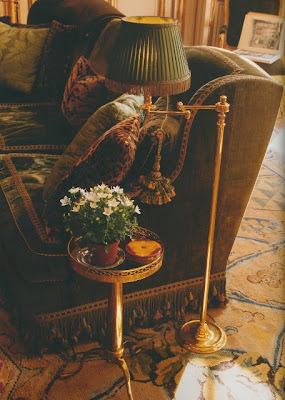 After all, Charlotte Moss' show house rooms are some of my very favorites. Her rooms at past Kips Bay show houses are legendary. 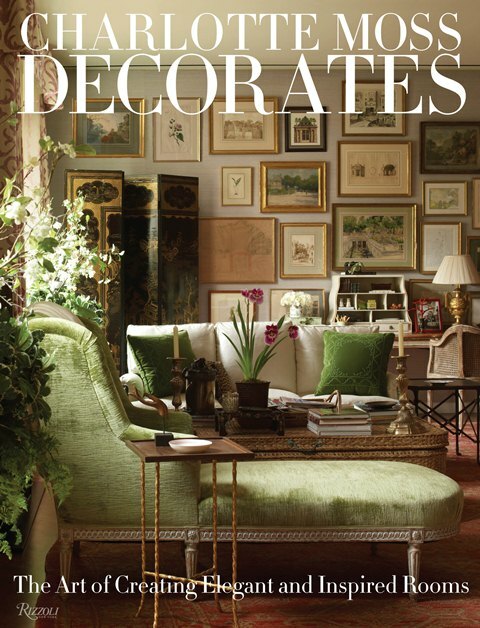 Fortunately, Charlotte has a new book out, Charlotte Moss Decorates: The Art of Creating Elegant and Inspired Rooms , which features more of her show house designs as well as a few other projects. As I had hoped, this book is chock full of inspiration. One of the things that I so enjoy about Charlotte's work is her attention to detail as well as her skill at layering, both of which are very much evident in this book. Each chapter focuses on a different room and the story behind that room. These stories are told through the book's engaging text (Mitchell Owens worked with Charlotte on the text; talk about the dynamic duo! ), photographs, and scrapbook collages that Charlotte created for each project. Charlotte's collages include all kinds of inspirational material such as photos, drawings, quotations, even snippets of textiles. They give the reader such insight into Charlotte's creative and educated way of approaching design. 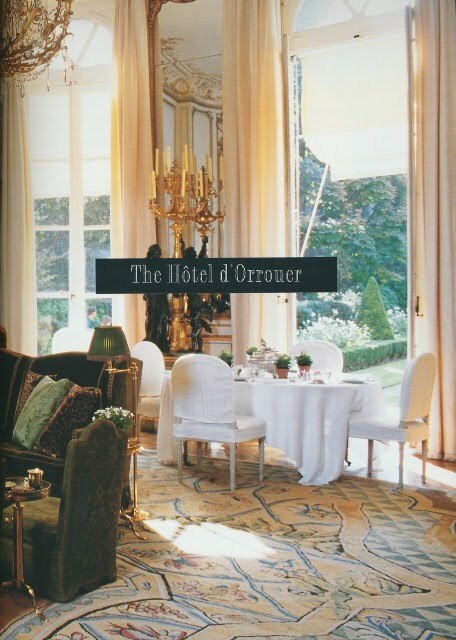 And finally, each chapter ends with a recap of lessons learned from each room, but they're presented to the reader like a Diana Vreeland "Why Don't You" column. How fun is that?! So, Why Don't You...check out this new book. I think you'll be as charmed with it as I was. 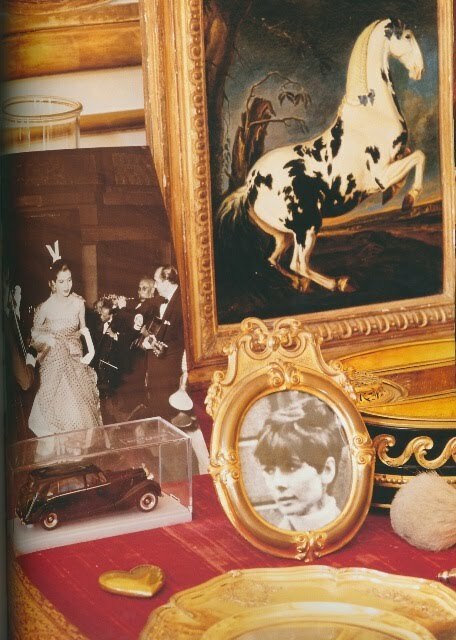 A scrapbook collage that tells the story of a sitting room that Charlotte designed for the 2009 Kips Bay Decorator Show House. 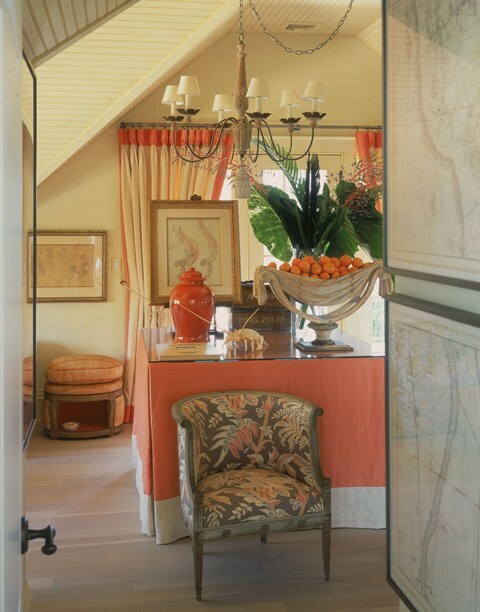 This space was imagined for a husband and wife who were well-read and well-traveled. 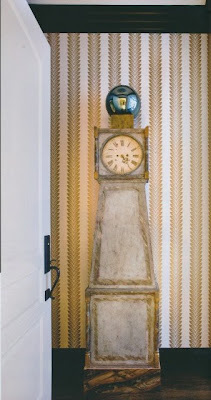 The vestibule off of the sitting room at the 2009 Kips Bay Decorator Show House. 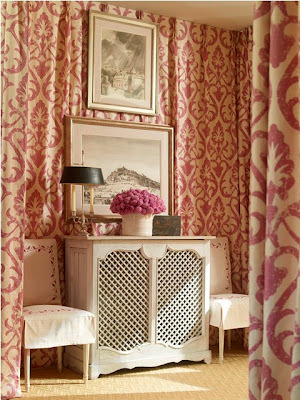 Charlotte curtained this space in a magenta Michael Devine fabric. Note too the Van Day Truex drawings. A room at the 2005 Southampton Designer Show House. The color scheme here consisted of Creamsicle colors. I think that I may have also been drawn to this room because of the dog bed in the corner. Adorable. Two detail photos of Charlotte's 2006 Kips Bay Show House bedroom. The second photo is a perfect example of Charlotte's eye for gracious details. All images © CHARLOTTE MOSS DECORATES, Rizzoli New York, 2011. Cover image and photographs #3, #5, and #6 by Pieter Estersohn; collage photo by Charlotte Moss; image #4 by photographer Eric Striffler.